Carl Cohn, right, leads school board in their retreat. With union leaders looking on, LA Unified’s school board spent four hours looking at options of how to cut or adjust health benefits to stave off a looming budget crisis. No decisions were made — the Tuesday “board retreat” was an information session — but the board analyzed details of the annual $1.1 billion in health and welfare costs, which take a growing chunk of the annual $7.5 billion budget. LA Unified continues to have some of the most generous health benefits in the country, for both current and retired employees. Both groups pay no premiums for themselves or their dependents for health care, which includes dental, vision, life insurance, and other benefits. LA Unified retiree benefits, according to the information presented, are more generous than for retirees of Los Angeles City or County governments, the city of Detroit, and of the school districts of New York, San Diego, Long Beach, and Chicago. George McKenna addresses fellow board members. The presentation also detailed how continuing to offer those benefits is unsustainable as enrollment and funding decline. 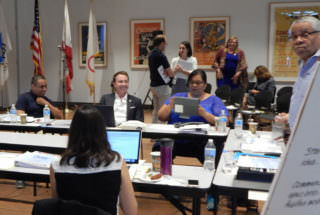 Some board members wanted to see more “out-of-the-box” solutions, such as newly elected board member Nick Melvoin’s suggestion that LA Unified provide its own medical care and have medical offices on district property. He also suggested additional incentives for opting out of the health plans. 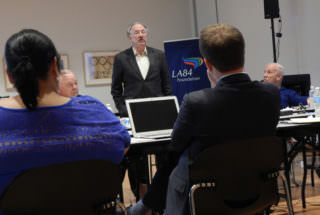 The board retreat was held in the West Adams District at the LA84 Foundation, which has educational programs and a library funded with surplus money from the 1984 Olympic Games. The meeting was open to the public but wasn’t broadcast live like other meetings. Audio of the meeting is posted on the district site. The board retreat started with a getting-to-know-you exercise for the board members to help them come up with core values for the district. 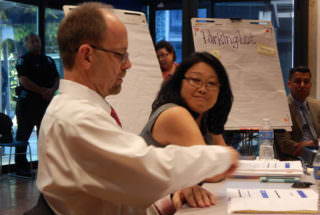 Carl Cohn, the executive director of the California Collaborative for Educational Excellence who led the workshop, praised the school board for tackling health and welfare as one of their first deep-dives. Scott Price and Janice Sawyer explain the health benefits. By acting on some of the recommendations of the 2015 Independent Financial Review Panel, the district has already saved $50 million by reducing prescription costs, and those savings could rise to $148.6 million by 2020, Price said. Also, after an audit, the district removed ineligible dependents of retirees, saving nearly $23 million. Board member Scott Schmerelson, who is a retired LA Unified principal, pointed out that many employees came to the district because of the benefits. The other board members seemed to generally agree, and Superintendent Michelle King nodded. “I’m thankful our bargaining partners are in the room and so we all can think of ways of how to do it differently based on what we’ve heard and go back and talk,” King said.